LaRayne imaciyapiyaye. My name is LaRayne. Waunspe Lakota. I teach Lakota. I also teach Native American Studies curriculum, which is a large part of my class. 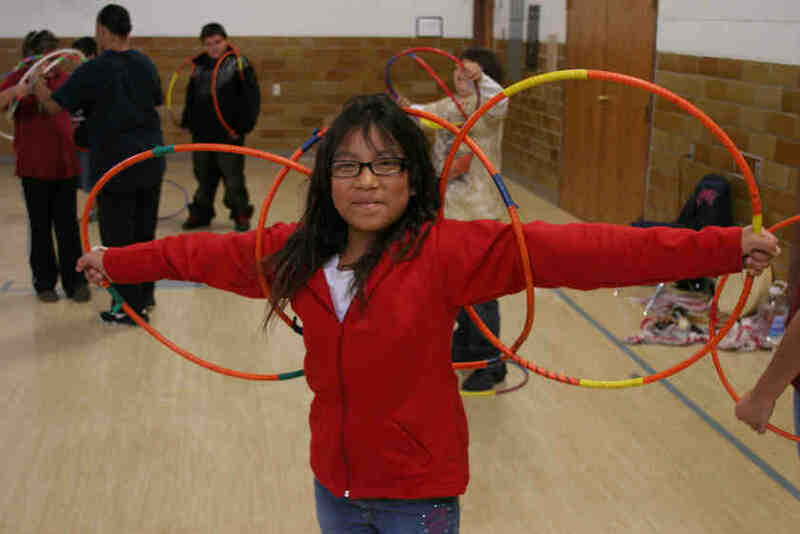 The Lakota (Sioux) kids love hoop dancing! Part of this teaching is being able to share the art of hoop dancing with the 3rd grade class. They are taught about the sacredness of our symbol of the circle. Then we create 5 different shapes/designs with our hoops. We honor our circle by dancing in each hoop before we pick it up with our foot. We then shape out the bird, eagle, Mickey Mouse, a butterfly and a circle before we dance with all the hoops above our heads. The kids are encouraged to dance to the beat of the drum while they create these designs. Yes, we are having a portion of it videoed, but I am not sure if and when that will be available for your eyes to see. I love my path that has brought me to St. Joseph’s Indian School. I truly enjoy living our motto: We serve and teach; we receive and learn. What a wonderful commitment you have to the children. I truly love my career choice. I do not look at it as a “job”, but as part of the good path of life.